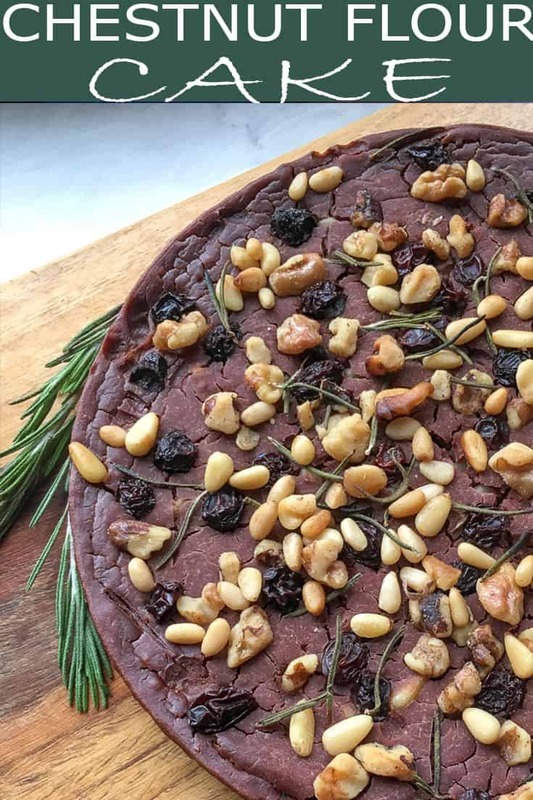 You will love this traditional Italian recipe for Castagnaccio, also known as chestnut flour cake. It’s a dense and uniquely flavored cake that also happens to be naturally gluten-free. Give it a try! 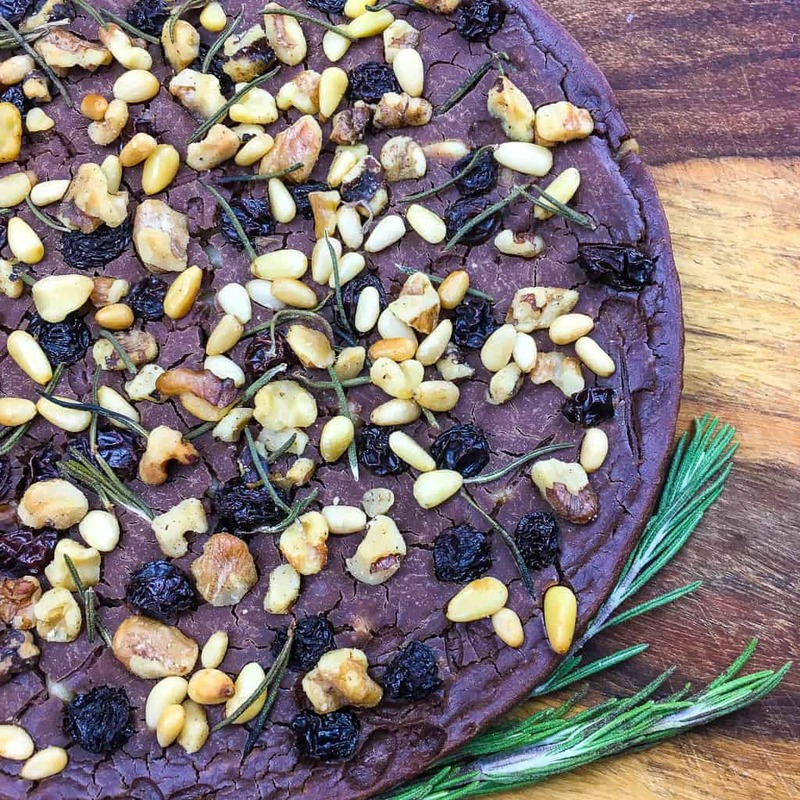 Other ingredients are sometimes included, such as rosemary or walnuts (as with this recipe). Due to its ingredients, it is a dense, flat cake. Castagnaccio is typically served in the autumn months following the annual chestnut harvest. Chestnut flour is made from, not surprisingly, ground chestnuts. 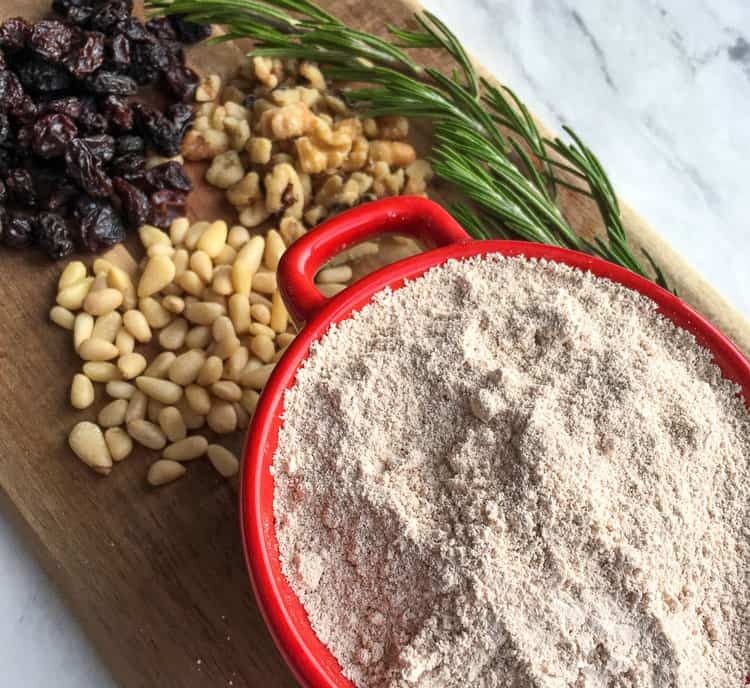 It’s a gluten-free flour that has a rich, nutty flavor and a slightly sweet smell. Chestnut flour is great for those on gluten-free, low carb, keto, and Paleo diets. Tip for using chestnut flour: For best results, sift the chestnut flour with a flour sifter before you use it. If you don’t have access to a flour sifter, you can add chestnut flour to a small fine mesh strainer. Gently shake it over the mixing bowl to remove any clumps in the flour. Among its many wonderful qualities, Castagnaccio is free from refined sugars. The only required sweetener is raisins, half of which (1/6 cup) go in the chestnut flour cake and half of which (1/6 cup) are used to top the baked cake. Two tablespoons of honey are also included in the recipe, but it’s optional and can be reduced or omitted entirely. What do you serve with Chestnut Flour Cake? Castagnaccio is not an overly sweet cake, so your choice of topping will depend on your level of sweet tooth. 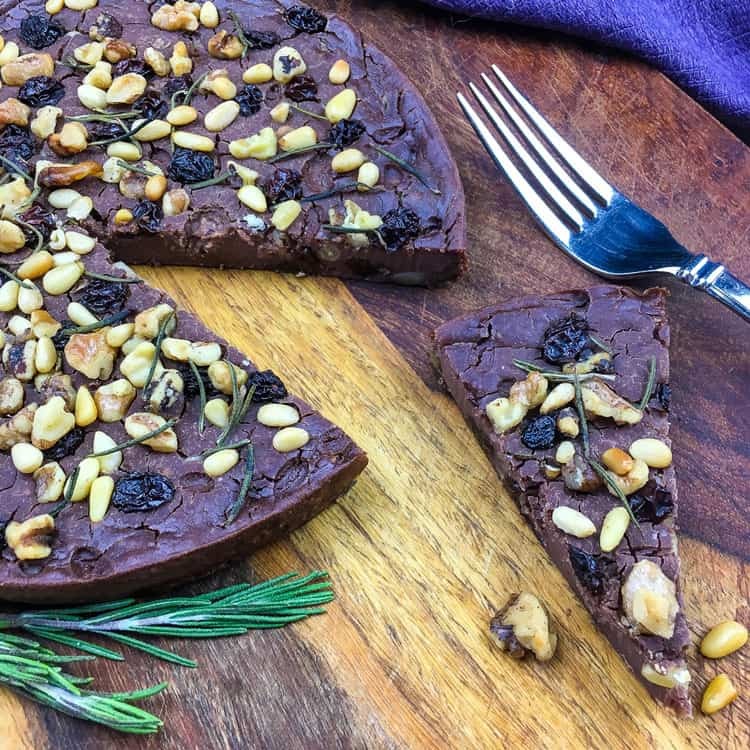 You can choose to top it with honey or serve it with a sweet wine if you want a sweeter cake experience, or you can top it with ricotta if you want a more savory cake experience. Castagnaccio is a dense and flavorful gluten-free cake. In a small bowl of lukewarm water, soak rosemary leaves and raisins. Set aside. Make sure your oven rack is in the center position. Preheat oven to 350°F. Grease a 9” pie pan with olive oil or a non-stick cooking spray, then set aside. Combine chestnut flour, water, honey, and olive oil in a large bowl using a fork. Continue stirring with fork until a smooth batter forms. If the batter is too thick, you can add a tablespoon or two of water to thin the batter slightly. Drain rosemary leaves and raisins, then pat dry. Add half of the raisins, walnuts, and pine nuts to the batter. Stir to combine all ingredients. Into the prepared pie pan, pour batter. Using a spatula, spread the batter so it forms a smooth and uniform layer. 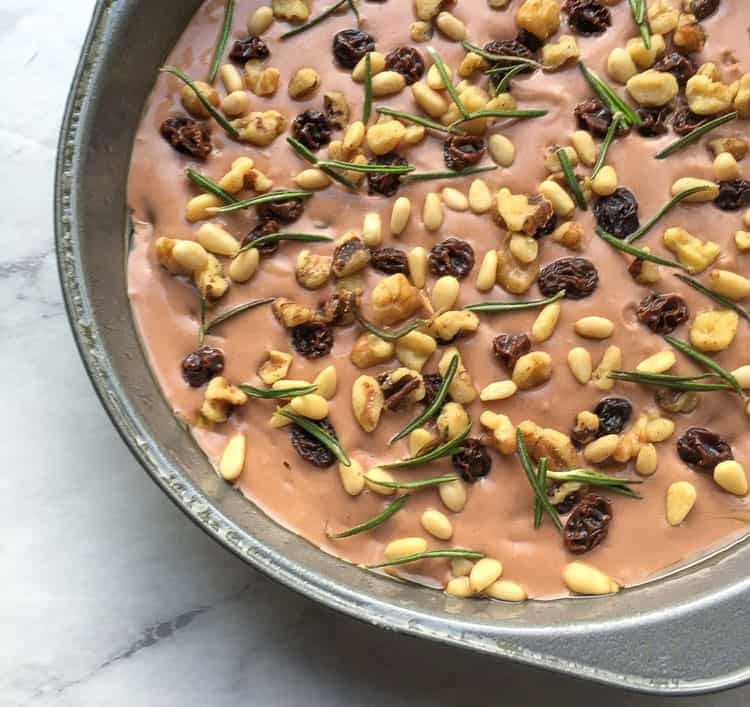 Evenly distribute the rosemary as well as the remaining raisins, pine nuts, and walnuts on top of the batter. Place the pie pan into a pre-heated oven. Bake for 30-35 minutes, or until the top of the cake is dried and starting to crack. Remove the cake from the oven and allow it to cool slightly before cutting. Slice it into thin slices and serve. *Honey is optional. Use more or less honey depending on your desired level of sweetness.